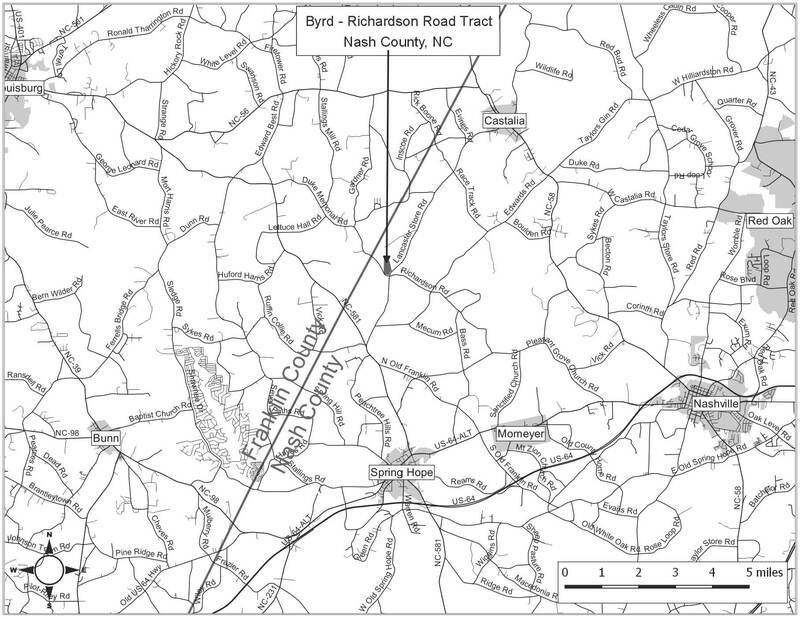 Byrd – Richardson Road Tract: 23+/- acre clear-cut. Good logging conditions. Bid Date: 1/24/19. SOLD – Timber Marketing and Management of the Carolinas, Inc.
Having been employed by John S. Byrd, II, we solicit bids on 23+/- clear-cut acres and 7+/- select-cut SMZ acres on his property shown on the attached map, which is located on Richardson Road in Nash County, North Carolina. Volumes are given in cords for pulpwood, Scribner Scale board feet for pine, and Doyle Scale board feet for hardwood. The above volumes are not guaranteed; however, care was taken in the field to assemble the enclosed tables. You should note how your utilization practices might vary from the above and make any necessary adjustments. A period of time until January 31, 2021 will be allowed to cut and remove the timber. Timber sale boundaries are flagged with pink-glo flagging. Streamside Management Zone (SMZ) boundaries are flagged with orange SMZ flagging. Only blue marked sawtimber size trees shall be cut within the flagged SMZs. Any newly constructed roads and log decks must be left in a graded condition upon completion of logging. All logging operations must be in conducted in accordance with the guidelines set out in the Best Management Practices Manual of the North Carolina Forest Service and any other applicable local, state or federal regulations concerning harvesting of timber. No tops or laps will be allowed to remain in streams, fields, forest roads, road right-of-ways or over property boundaries. They must be pulled back immediately. No boundary line trees shall be cut, unless marked for cutting. Buyer shall be responsible for removal of all trash (cans, bottles, paper, etc.) from loading decks and for any contamination of the property by fuel, grease or oil spills. Buyer or logging contractor must maintain workman’s compensation insurance and a minimum of $1 Million general liability insurance. Buyer must assume all risks incident to timber harvesting and shall indemnify, defend and hold harmless the Sellers and the Seller’s agent, Timber Marketing & Management of the Carolinas, Inc., from and against loss of or damage to property of the Seller, Agent or others and injuries to or death of all persons resulting from the Buyer’s timber harvesting operations. TMMOC reserves the right to stop harvesting operations if, in its sole opinion, excessive rutting or damage to the property is occurring. Buyer will be responsible for repairing any excessively rutted surfaces. Buyer must notify Timber Marketing & Management at least 48 hours prior to moving equipment onto the property. A pre-harvest meeting with the logger, buyer, and TMMOC must be conducted before any trees may be harvested. Prior to the start of logging, Buyer shall deliver to TMMOC a performance bond in the amount of $1,000.00 made payable to Timber Marketing & Management of the Carolinas, Inc. This performance bond shall be retained by TMMOC in a non-interest bearing account and may be used by TMMOC, on behalf of the Seller, to perform any act required to be done by the Buyer, under the terms of this contract. In the event TMMOC/Seller uses any portion of the performance bond, Buyer shall restore the performance bond to its full amount immediately upon demand by the Seller. Any unused portion of the performance bond shall be returned to Buyer within 10 days following the completion of a satisfactory final logging inspection. The amount of the performance bond shall not be deemed a limitation on Buyer’s liability for damages. Only sealed bids will be accepted and owners reserve the right to reject any or all bids. BIDS SHOULD BE MAILED TO: John S. Byrd II, c/o Timber Marketing & Management of the Carolinas, Inc., P. O. Box 97803, Raleigh, NC 27624-7803 or hand delivered to Suite 101, 800 Salem Woods Drive, Raleigh, NC 27615 or they may be telephoned in prior to the time of bid opening. Bids may also be faxed to 919-848-2230. Bids must be made on a lump-sum basis and must be received at this address not later than 11:00 a.m. on Thursday, January 24, 2019. There will not be any scheduled show trip of the tract; however, you may call and set an appointment or you may inspect the property at your own leisure.